August 4th was Ceilidh’s 15th birthday and we had a small party. Ceilidh has always loved to sing and will belt it out at the least provocation. As you can see in this photo, Freckle didn’t grow up with a tradition of birthday song and was noticeably uncomfortable with her lack of familiarity with the words. “Um … sure. Lily Tomlin says, ‘We’re all in this together–by ourselves. '” Smack smack smack went the muffin. Then Ceilidh sighed a long, noisy sigh … the way Pugs do. She said, “But mostly I think that Bette Davis hit the nail on the head when she said ‘Old age is no place for sissies! '” Freckle just stared at her as Ceilidh picked up the remaining piece of her birthday muffin and winked at us. When is a mango scary? Never thought of a mango–or more correctly, HALF a mango–as scary? I have. This morning we went for coffee with friends at little cafe in the neighbourhood. I’d taken Freckle and Ceilidh for a walk before we left, woofed down some cereal and fruit and off we went. When we left, both Ceilidh and Freckle were settled in their beds. We were happily visiting over coffee … catching up on life … and then it hit me. 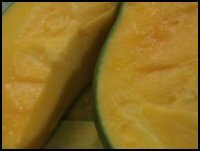 The image of half a mango … a smallish, half-eaten mango … sitting on the counter near the sink! Oh my gawd! I gulped … and realized that as scary as the half-eaten mango was… it was probably too late now. One of the other three at the table was well into a story (was it a workplace saga or a pet saga? Can’t quite remember.) and so I waited before I blurted out that I’d have to run home now. You see, Freckle absolutely LOVES mango … and when Freckle stands up on her back legs, she’s quite tall! Tall enough to scoop things off the top of the kitchen counter with her arms. This we learned a few weeks ago when we came home to discover new and fun things to do with cherry tomatoes (SEE STORY BELOW). Have you ever wondered what to do with cherry tomatoes? You know how you can buy three of the red mesh bags filled with 18-20 cherry tomatoes for $5. A few weeks ago, I’d picked up some fresh fruit and veggies (including the great cherry tomato deal). I’d unpacked them and left them on the counter while we went out for an hour or so. A while later, we arrived home and opened the front door to the most amazing sight! There were cherry tomatoes … say 60 or so … ALL OVER THE FLOOR! They were absolutely beautiful! Arranged in such a carefree manner … some partially mashed and some in pristine condition as if they’d just been plucked from the vine. And … artistically tossed into the middle were the red mesh bags all torn open to facilitate the escape of the tomatoes. I said, “Freckle, what is this?” pushing the handful of tomatoes in front of her. She gave me a very serious look with big brown eyes. I think I heard her say, “Wow. Where did those come from?” … but I”m not sure. In an attempt to make light of the situation, Freckle began to bat a few tomatoes around again as Mary Doug and I started to clean them up. That idea was met with a stern “FRECKLE!” She stopped immediately and looked terribly remorseful again. So, we collected all visible tomatoes and put aside the ones that survived unscathed. 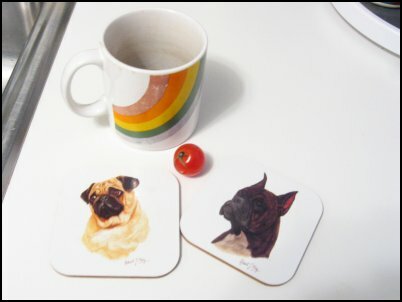 By this time we were able to laugh at the thought of our livingroom and dining room filled with cherry tomatoes. We scrubbed off the streaks of dirt on the edge of the counter where it was evident that Freckle had leaned in to pull the mesh bags down and vowed that we must be cautious about what we left within reach in future. Never a dull moment! The next day, I found tomato seeds splashed across the TV screen. Two days later, we found Freckle and Ceilidh trying to retrieve something from under a cabinet. Yep … it was a cherry tomato–one of the pristine ones. A week after that, Freckle found another tomato in the corner of the dining room. 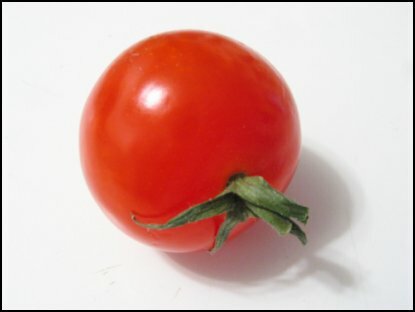 And just a few days ago (several weeks after the tomato fiasco), I found yet another cherry tomato while vacuuming! What would we do without these creatures? So just how DOES a Boxer star dress? I know that this is a question that’s kept me awake many nights. And now we know. 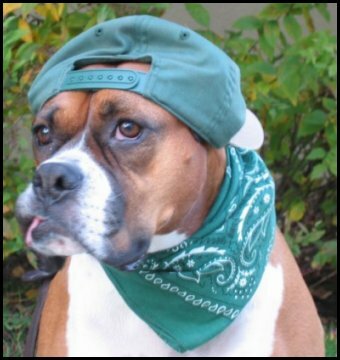 Granted, we had to work pretty hard to get this shot of Freckle in her baseball cap. Everytime we’d get the perfect angle (read: get the silly thing to sit on her head before she whipped her head around and sent her lovely cap flying! ), the lighting would change … or someone would walk past and shift her attention. And why is Freckle a star? Well, let me count the ways… but the reason that led to this photo shoot is that she has become a star in her dog training class! [Never mind that many of the other parents are saying the same about their dogs.] Freckle has been held up as the model–“Watch how Freckle does it.” Or “Freckle’s got it. Watch her.” And usually at least once each class: “Well done, Freckle!” from her extraordinarily talented trainer, Shannon. 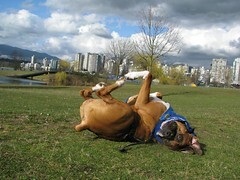 Those of you who know Boxers know just how momentous Freckle’s stardom is. Of course, a fair bit of credit must go to Mary Doug who spends hours and hours working with Freckle. To watch them make their way down the street, it looks like freestyle dance (without the music–unless you hum along). Overall, I think the two of them have done a terrific job! Congratulations Freckle! And congratulations Mary Doug on getting this shot of the girl with her cap on her head. Every wonder what it would be like to smell like a dog? No, I mean to be able to smell as well as a dog? It was a rainy day yesterday and I was watching Freckle and Ceilidh curled up asleep in Freckle’s bed. Freckle was dreaming and her nose was doing a wild two-step. Obviously something in her dream was really smelly. I’ve also read that the fact that dogs have wet noses all the time allows them to trap scent in the mucus on their noses and inside their nasal passages. All of this must be helpful when Ceilidh stops for 20 minutes to sniff every dripping leaf on the corner shrub each morning. Apparently, when dogs sniff urine left by neighbour dogs, they can collect a lot of information. Guess they don’t call it “pee-mail” for nothing! They can tell whether the “author” was male, female, neutered/unneutered, friend or stranger. They can tell their social standing in the dog community and even the dog’s mood at the time of marking! UBC psychologist and canine behaviour expert, Stanley Coren, explains dogs’ sense of smell as similar to the human ability to see multi-layers. He gives the example of looking at a bed with a quilt and pillows, and a book and a pair of glasses all piled on. We can see each of these individual parts of the scene. Similarly, dogs are able to identify different elements that make up the stench that we’d call trash—rotten fish, old French fries, tartar sauce with mold, rancid cashews, etc. There’s a lot of media these days too about whether dogs can smell cancer in humans. 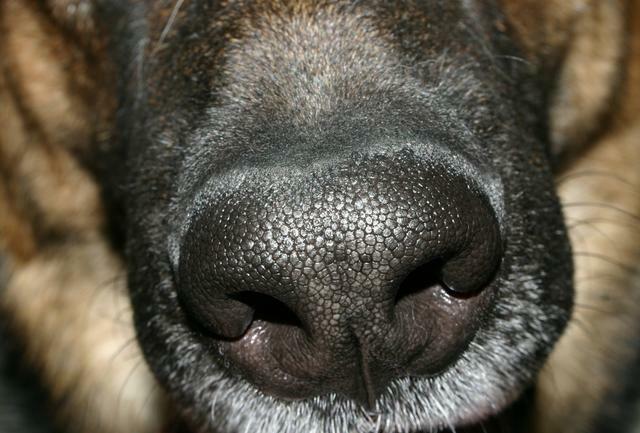 Some reports say that dogs can detect cancer by sniffing a person’s breath! I can’t imagine what it must be like to have such a keen sense. Talk about overload… must be a real burden! No wonder dogs sleep so much. Just tryin’ to get away from the smells of everyday life.